Player-coach Matt Goode could barely hide his disappointment after seeing his side’s eight-match winning run ended by Marlborough. 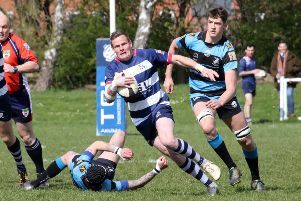 Banbury Bulls looked set for a crucial Wadworth 6X South West One East victory over Marlborough until three late tries, when Goode’s side were down to 14 players, turned the tide for the Wiltshire outfit. Following Saturday’s 32-29 defeat at the DCS Stadium, Bulls slipped down to fifth but it was close. Bulls had led midway through the second half until those three tries changed the game. Goode said: “I’m gutted, and gutted for the boys. I asked for the heart and the want that we didn’t have last week. Three of Marlborough’s tries came when Bulls were down to 14 players after Ed Phillips was sent to the sin-bin for ten minutes and Sam Stoop had gone off injured. Goode knew that was the big turning point in the contest. The late try from Ed Berridge secured two bonus points for Bulls and those couple of points could be vital at the end of the season, given how tight the race for second place is.